The Federal Trade Commission is mailing 38,553 refund checks totaling $1.9 million to people who bought Pure Health or Genesis Today green coffee bean extract supplements from retailers such as Walmart. This is the second refund mailing related to this FTC case. 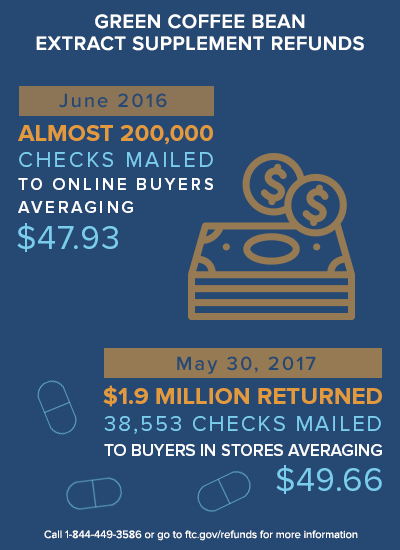 In June 2016, the FTC used the defendants’ sales records to mail full refunds to nearly 200,000 people who bought the products online. When the first checks were mailed, the FTC announced a claims process for people who bought the supplements in retail stores. People who submitted valid claims before the deadline are now receiving full refunds, averaging $49.66 each. Recipients should deposit or cash their checks within 60 days. The FTC’s January 2015 complaint charged Pure Health LLC, Genesis Today, Inc., and their principal, Lindsey Duncan, with deceptively claiming that the supplement would cause people to lose 17 pounds and 16 percent of their body fat in just 12 weeks without diet or exercise, and that the claim was backed up by a clinical study. The FTC’s settlement barred the defendants from making deceptive weight-loss claims about any food or dietary supplement, and required them to pay money for the refund program. Analytics, the refund administrator for this matter, will begin mailing refund checks today. If you have questions, please call 1-844-449-3586. To learn more about the FTC’s refund program, visit www.ftc.gov/refunds.